Your bathroom is a vital space for you to cleanse, unwind and revitalise. You want it to have a pleasant and inviting atmosphere, while displaying the colours, textures and fittings which make you happy. Successfully bringing these elements together when renovating your bathroom can be a challenge. Leave that challenge in our hands, because we are committed to delivering the bathroom you expect. Our well-oiled team of experienced, qualified tradespeople work together on each bathroom renovation. This helps ensure your bathroom is completed with the utmost efficiency and skill, within the agreed timeline and budget. Each tradesperson follows a strict schedule, which is shared with you, so that you know what’s happening at all times. Arran Axtell, owner of Bathroom Transformations, personally oversees every renovation project. Arran will spend as much time with you as you need, planning your bathroom and going over the details before the work begins, then communicating with you regularly throughout the process. We receive great feedback from clients reflecting the value and comfort of having one-on-one, personalised advice from the owner of the business. We want you to relax knowing that you will get the bathroom you expect, on time, clean and with as little disruption to your life as possible. Our appropriately qualified tradespeople know what they’re doing, because they’ve been doing it for a long time. We know you’ve got a busy life and have important things to do. You can get on with things, knowing we’re taking care of your bathroom and respecting the home surrounding it. We want to make things as easy for you as possible. That’s why we provide you with one point of contact right from the start and throughout your project with no worries of having to chase any tradespeople because our team will take care of it all. We go the “extra mile” for our clients to finish on time and on budget; we don’t take shortcuts; we do it properly and our work produces great results. The proof of these assertions can be found in the testimonials of our many happy customers, who have been happy to share their experiences, so you can feel confident that you’ve come to the right place. 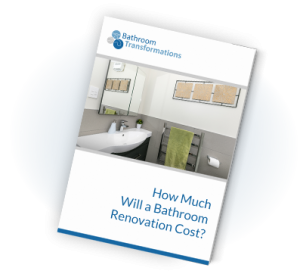 Bathroom Transformations has built a solid, professional reputation and we’re proud to stand behind it. “Right from the start Arran made the whole experience a breeze by offering good advice in terms of planning and options available to us. His attention to detail and effective communication ensured that the planning and installation phase of all our bathrooms was achieved seamlessly and on time.